More Aggressive "S-Type" Cat-Back. 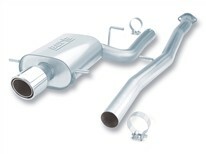 The mellow "Touring" cat-back exhaust is part# 140053, also known as the Borla Hush. Borla Performance once again leads the industry with a high flow performance exhaust for the hot Subaru WRX and WRX STI. This Cat-Back™ system, BORLA #140075, is custom designed by BORLA engineers for the 2.5L turbocharged 4-cylinder engine with automatic and manual transmissions. Winning on racetracks around the world has given BORLA a leg up on the competition with trickle down technology from the world ’s fastest cars. The unique design is a direct bolt-on fit that meets all emission requirements. The system has shown significant flow and performance improvements by virtue of BORLA XR-1® patented technology utilizing 3" tubing that exits with a super looking BORLA logo embossed 4"angle cut, rolled edge, single round polished tip. More flow means more power, and if you tune this turbocharged super import, that flow will simply allow even more power. When you get a close look inside this muffler, you can see the patented BORLA XR-1® multi cores -- that look says total performance. Increased fuel mileage is an added benefit. And, one more thing, it has a great sound, too, but then you’ve come to expect that from BORLA. Add a BORLA header (#17217) for even more performance. Borla Performance Industries, the original pioneers of high quality austenitic stainless steel (superior to T-409 or aluminized steel) free flow exhaust utilizes its patented award and race winning technology to deliver quality, sound, performance gains and enhanced fuel economy – all with an easy bolt-on installation. All BORLA street products carry the famous BORLA written million-mile warranty.